What Is Craps? - Casino Answers! Casino Answers » Craps » What Is Craps? If there’s one game you should play at a casino be it live or online, it’s Craps. 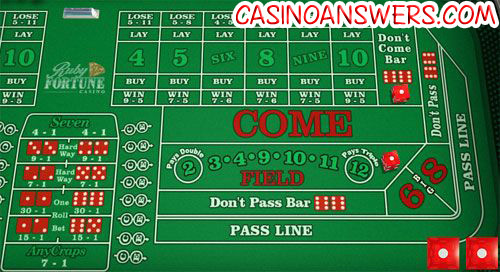 Craps is one of the funnest games to play, and should be part of any casino experience. Craps is a game that attracts all audiences – at its core, Craps is a very basic game. One player, known as the “shooter” throws two dice, and the players bet on what numbers could possibly come up from the dice. Craps however, is a game playable by everyone. The above description may not make it seem like the most exciting casino game, but for a lot of people it really is. First of all, Craps is a game that offers low minimum bet limits which means anyone, no matter their bankroll, can play. Craps also offers the best possible bets available when it comes to house edge, with bets with practically no house edge, allowing you to play an almost 0EV game, as opposed to every other casino game where you will have a negative expected value. Craps also appeals to the action junkies, and the people looking to win big off very little, with a wide variety of bets. Craps offers a crazy amount of bets, from the standard pass bets to odds bets, to of course the popular proposition bets. As you can see, there are a variety of betting options when it comes to Craps. One thing you should also know is that Craps is as close as a “team” game as you usually get when you are at a casino. You will often find everyone bets the same way and takes the same bets, as it increases the fun of Craps when you are basically playing with a bunch of other people and teaming up “against” the casino. And believe me – there is no greater feeling in the world having everyone chant “Hard 8” then managing to roll one. Be warned though – Craps isn’t an easy game to get into, and it can be both intimidating and confusing for beginners. There is a lot of specific craps jargon, and also a lot of Craps superstitions you have to be aware of. Playing Craps at a live casino is the best, however the website Bovada does a great job at emulating a Craps game. It’s also highly recommended that you practise Craps online before actually playing for real money at a casino – you can try Craps out for free either at the aforementioned Bovada, or using our Craps flash game. Where does the term Craps come from? Craps Newbie Guide. Craps Beginner Guide.